Daryl Haggard is an Assistant Professor of Physics at McGill University. She is an observational astronomer and received her PhD at the University of Washington (Seattle, WA). She and her group study Sagittarius A*, the supermassive black hole at the heart of our Milky Way Galaxy. Haggard's team uses radio, submillimeter, near infrared, and X-ray telescopes to probe Sgr A*'s exotic environment, where strong gravity plays a key role. Her team also studies the interplay between distant growing supermassive black holes, or active galactic nuclei, and their host galaxies. And when opportunity knocks, she and her group search for X-ray flashes emitted from neutron stars and black holes when they collide. These collisions send ripples through space-time, gravitational waves, now being detected by LIGO and Virgo. What are gravitational waves? What are neutron stars? Gravitational waves are “jiggles” in the fabric of space-time. They are like sound waves traveling through the air around me while I talk, but gravitational waves race through the Universe at the speed of light and carry LOTS of energy away from their source. Meanwhile, neutron stars are basically big balls of neutrons. They are born during supernova explosions when the gravity on the inside of a star is so intense it forces the electrons into the protons, making neutrons. Actually, the fusion that happens during these supernovas is how atoms like oxygen, iron, all the stuff we need for life, gets built. Neutron stars weigh two or three times the mass of our Sun, but are only the size of a modest city, like Boston or Montreal. They are incredibly dense objects. For example, if you took the Earth’s whole human population and squished it into an object the size of a sugar cube, we’d all become a neutron star. Originally from Rochester, NY, Wen-fai Fong received double Bachelor's degrees in Physics and Biology at the Massachusetts Institute of Technology, and earned her Ph.D. in Astronomy & Astrophysics from Harvard University. She was subsequently awarded an Einstein Postdoctoral Fellowship, which she took to the University of Arizona's Steward Observatory. She is currently a Hubble Postdoctoral Fellow at Northwestern University and will begin her appointment as Assistant Professor there in Fall 2018. Wen-fai is excited about unraveling the mysteries enshrouding cosmic explosions, including gamma-ray bursts and gravitational wave sources. Gravitational waves are best described as ripples in space-time. To envision these merging compact objects, I always try to think of two round objects on a very flexible trampoline, rolling and rolling around each other. For the most flexible of trampolines, they will create some sort of pattern outward, while also spiraling toward each other and eventually colliding. It’s an oversimplified version, but that is how I best imagine what is going on. In reality, the specific properties of the system — the masses, spins, orbital orientation, and distance — determine the very special pattern of the gravitational waves that are radiated from a system. Scientists then match that pattern against a gigantic bank of patterns by the gravitational wave experts who are able to determine very specific properties of the system. So it is a very neat and elegant problem that is made possible by many years of hard work. Raffaella Margutti obtained a PhD degree in Physics and Astronomy from the University of Milano Bicocca, Italy, in 2010, working on the broad-band (radio to gamma-ray) emission from relativistic jets in gamma-ray bursts within the Swift team. She then worked as a postdoctoral fellow at the Institute for Theory and Computation (ITC) at Harvard University, and then moved in 2015 for one year to New York University as James Arthur Fellow. Raffaella began a faculty position at Northwestern University (Physics and Astronomy) in 2016. She has been working in the field of Astronomical transients for more than a decade, with a wide range of expertise including, Stellar Explosions, Gamma-Ray bursts, Tidal Disruption Events, Stellar Outburst, and now, counterparts to GW. Gravitational Waves are ripples in space-time that become particularly strong when very violent event in our Universe happen, like the merge of two very peculiar stars that we call neutron stars (NS). NS are what get left behind after a big star like 10 times the Sun ends its life with a big explosion. Eleonora Nora Troja was born and raised in Palermo, Sicily. After completing her PhD at the University of Palermo, she moved to NASA Goddard Space Flight Center as a NASA Postdoctoral Program Fellow. Her main research interest is the study of gamma-ray bursts, and in particular the connection between short duration gamma-ray bursts, neutron star mergers and gravitational waves. Beside her studies, she also leads the Swift Guest Investigator Program and serves as co-chair for the Athena mission working groups. Gravitational waves are ripples in the fabric of space and time. According to Einstein’s theory of general relativity, every moving object actually emits a tiny amount of gravitational waves, but the signal is usually too small for us to detect. In order for us to detect gravitational waves, we need to wait for catastrophic events like the collision of two neutron stars. This brings to the second question, what are neutron stars? Neutron stars are some of the most exotic and dense objects in our Universe. These stars weight as much as our Sun but they are much smaller in size. A neutron star can extend up to 15-17 miles across, this is more or less the size of Washington D.C.
Women have played a key role in observing solar eclipses and expanding our understanding of how the Sun, our nearest star, works. The total solar eclipse that will take place over North America in a couple of weeks is a chance for millions of people to experience an exciting event (with proper viewing glasses to protect our sensitive eyes, of course!). Given the population's demographics, it stands to reason that about half of those who will be under the spectacle of totality will be women. This is rather appropriate to reflect on. To quote the title of the best seller by Nicolas Kristof and Sheryl Dunn (by way of Mao Zedong), "women hold up half the sky." But women have been doing far more than just shouldering the weight of the heavens over the years. We have been actively studying the Sun, Moon, stars and beyond for millennia. Women have played a key role in observing solar eclipses and expanding our understanding of how the Sun, our nearest star, works. Many people associate the Smithsonian Institution with a handful of museums on the National Mall in Washington, D.C., when, in fact, the Smithsonian consists of 19 museums, 9 research centers, a zoo, and affiliates around the world. 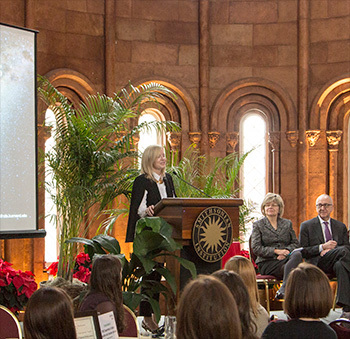 One fact that may not be known to some is that NASA’s Chandra X-ray Observatory is inextricably linked with the Smithsonian. The Smithsonian Astrophysical Observatory (SAO) in Cambridge, Mass., was at the center of the conception and development of the telescope and today it controls Chandra’s science and flight operations. In other words, Chandra is both a NASA and a Smithsonian mission. We are thrilled to announce that this year’s winner for the 2016 Smithsonian Education Achievement Award is Chandra’s visualization lead, Kimberly Arcand. 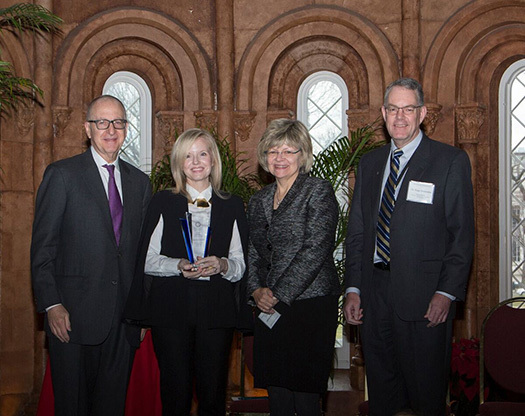 Arcand was presented with the award on December 8, 2016 at the Smithsonian Castle in Washington, D.C. 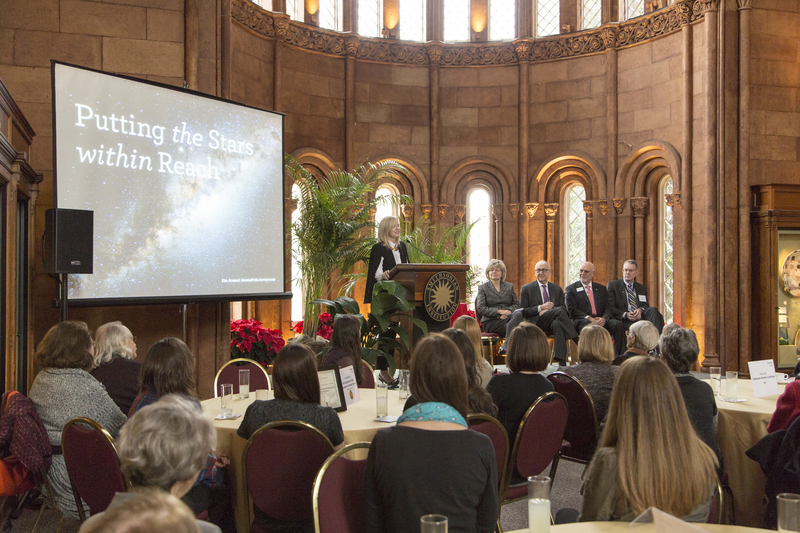 Among the Chandra-led projects being recognized were the NASA-funded public science programs "From Earth to the Universe" "Here, There & Everywhere," and “Light: Beyond the Bulb,” as well as Chandra community programs for girls and boys to improve coding skills with NASA data, and cutting-edge Chandra data visualization projects such as data-based 3D printed supernova remnants. I wanted to go into a career in astrophysics because I fell in love with space--its marvels and secrets. As I learned increasingly about physics in school, I became more and more inquisitive. It seemed like the more I thought I knew, I realized that there were actually so many more questions to be answered. I always had an affinity with science, but it was the desire to discover these unanswered questions about space that led me to a career in astrophysics. I became interested in science at a very young age. I was always very inquisitive, but it wasn't until I began putting the scientific method to use that I understood what science could achieve. I loved every part of my science projects, the investigation, experimentation, and drawing conclusions. That was how I began to think of science as a future career.